Figure 7-19. Outside air aids in cooling the engine. The air cooling system is less effective during ground operations, takeoffs, go-arounds, and other periods of highpower, low-airspeed operation. Conversely, high-speed descents provide excess air and can shock cool the engine, subjecting it to abrupt temperature fluctuations. Operating the engine at higher than its designed temperature can cause loss of power, excessive oil consumption, and detonation. It will also lead to serious permanent damage, such as scoring the cylinder walls, damaging the pistons and rings, and burning and warping the valves. Monitoring the flight deck engine temperature instruments aids in avoiding high operating temperature. Most aircraft are equipped with a cylinder-head temperature gauge that indicates a direct and immediate cylinder temperature change. This instrument is calibrated in degrees Celsius or Fahrenheit and is usually color coded with a green arc to indicate the normal operating range. A red line on the instrument indicates maximum allowable cylinder head temperature. To avoid excessive cylinder head temperatures, increase airspeed, enrich the fuel-air mixture, and/or reduce power. Any of these procedures help to reduce the engine temperature. On aircraft equipped with cowl flaps, use the cowl flap positions to control the temperature. Cowl flaps are hinged covers that fit over the opening through which the hot air is expelled. 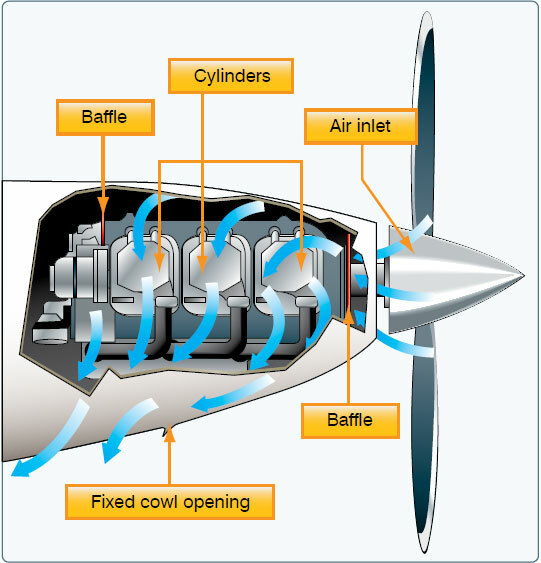 If the engine temperature is low, the cowl flaps can be closed, thereby restricting the flow of expelled hot air and increasing engine temperature. If the engine temperature is high, the cowl flaps can be opened to permit a greater flow of air through the system, thereby decreasing the engine temperature.